Quantum-B™ Complete B-Complex is the first High Potency B-Complex supplement in a convenient sustained release two-caplet serving-size, (for round-the-clock protection), formulated to provide a full 100% Dietary Requirement of the essential nutrient Choline. Choline plays a critical role in fetal development. What’s more, both postmenopausal women and older men may require higher amounts of Choline to prevent organ dysfunction. Choline is an essential nutrient in Brain Development, and Liver Function. In addition to the essential nutrient Choline, Quantum B Complete Vitamin B Complex is fully loaded with the B Vitamins your body needs: Vitamin B1, Vitamin B2, Vitamin B3, Vitamin B6, Folic Acid, Vitamin B12, Biotin, and Vitamin B5. "Click" the Supplement Facts Tab above to view the Label Copy. It’s important to understand that the human body is complex and the manner in which nutrients interact in the body is equally complex. For instance, you may be deficient in one of the B vitamins. You would think that this would only affect the functions of this vitamin. 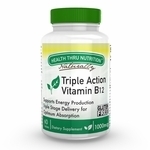 In actuality, the B Vitamins work synergistically so a deficiency in one will often affect another nutrient or, in some cases all of the B vitamins. Essentially, there is a necessary homeostasis, or balance, among the B vitamins, where even overconsumption of one B can also negatively affect the whole. This is where our B complex comes in. 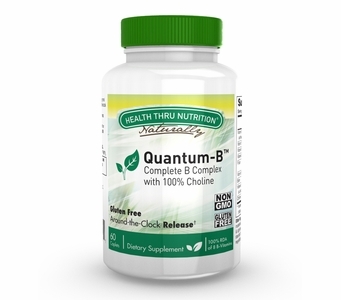 By combining all of the major B Vitamins in a time release caplet, Quantum B ensures that you are not only receiving the optimum, balanced amount of B vitamins but that you are receiving them in a sustained release natural way. Your body is able to naturally assimilate Quantum B and therefore you are able to maintain the B vitamin balance necessary for hundreds of crucial functions in the body. A sustained release B complex is the ultimate in body balance nutrition! *100% of the DRI for adult Males (130% for adult females) established by the Institute of Medicine, National Academy of Sciences. Free of: Milk and milk by-products, egg and egg by-products, fish and fish by-products, shell fish and shell fish by-products, tree nuts, wheat and wheat by-products, peanuts and peanut by-products. Directions: Take one (1) caplet with the morning meal and a second caplet with the evening meal for round-the-clock B-Complex with Choline protection. Staywell® is a registered trademark of Tishcon Corp.
Quantum-B™ is a trademark of Tishcon Corp.